I didn’t realize until working on scheduling these walks that in my mind, I don’t look forward at all to the winter landscape. All week, I had been holding out for a day with heavy frost so that I could bring a camera to capture some beautiful pictures. Even though a lot of the northwest is still green, things are soggy and brown as well. Nature doesn’t seem like she is at her best. For the first time this week, I slept in late and had a jarring start to the day. I looked at my clock realizing that it was already 10 am. If I didn’t get out now, the sun would be up melting away that beautiful frost. Turns out that I had the best of both worlds. As I made my way down the first street, the sun was warm enough to take the edge off of the cold, and the frost was beginning to melt causing showers of frost pellets as birds flew from the trees. I walked on looking for leaves covered with crystalized frost. I headed to the most shaded street that I could think of to try to get some pictures. That street was amazingly sunny that morning, but my trek had taken me farther from home than usual. Walking back home was where the magic happened. I heard the quacking of ducks. I wasn’t expecting nature to be in full swing. I crossed over to the other side of the road and looked down to see around 20 plus ducks swimming around in the marshy wetlands below. I saw the movement of a shy raccoon heading into a burrow to remain hidden from a human’s view. I noticed the chirping of birds and realized that these little creatures are also eagerly waiting for the warming of the sunshine. I was not the only one taking full advantage and immensely enjoying the crystal clear blue sky and appearance of the sun. I must remember how uplifting it is for the spirit to be out on foot on the good earth. 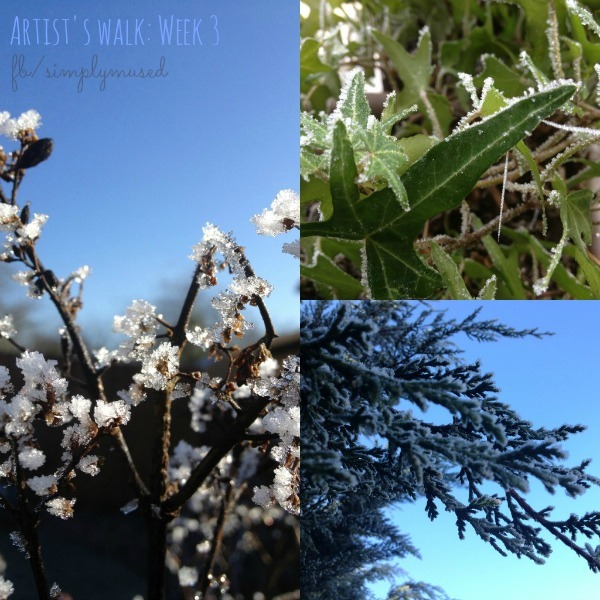 This entry was posted in Artist's Walk and tagged creativity, the artist's walk, The Artist's Way, walking, winter. Bookmark the permalink. You write so beautifully! I can see all of the fantastic imagery that you’ve described. It must have been such a nice walk. I’m also doing the Artist’s Way (I’m on week 5), and I’m blogging about it as well. It’s such a fantastic program. I’ve really become attached to the morning pages (although this is probably the part of the program that I’ve struggled with the most). I will be returning to your blog for sure. Great Post!